“The rent is too damn high” is a common sentiment here in Grand Rapids, where rapid growth has resulted in a higher cost of housing. 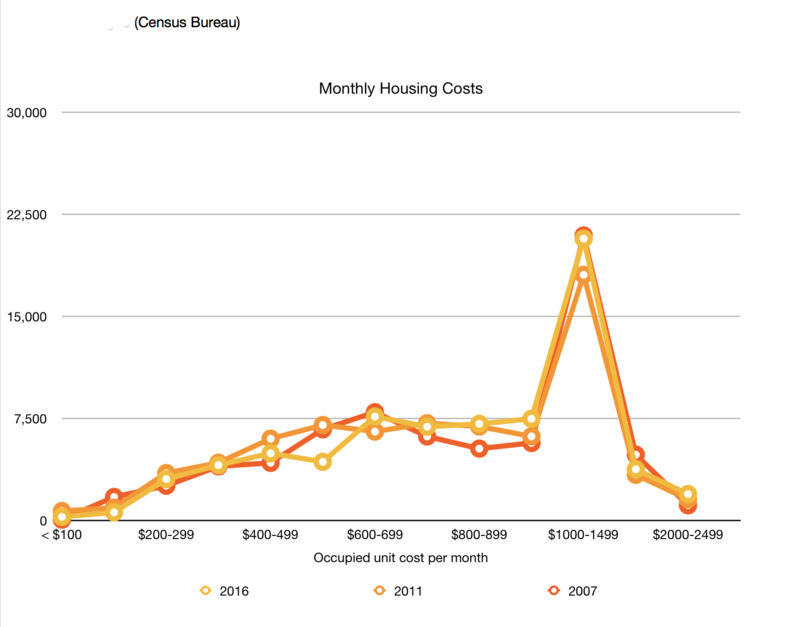 Take a look at the last 10 years of changing and rising costs of housing in GR. According to Trulia’s Market Trends for Grand Rapids, between August 2008 and August 2017, the value of Grand Rapids residential home sales has risen 37 percent (fig. 5). Median gross rent has risen roughly 29 percent between 2007 and 2016, according to US Census Bureau (fig 1). 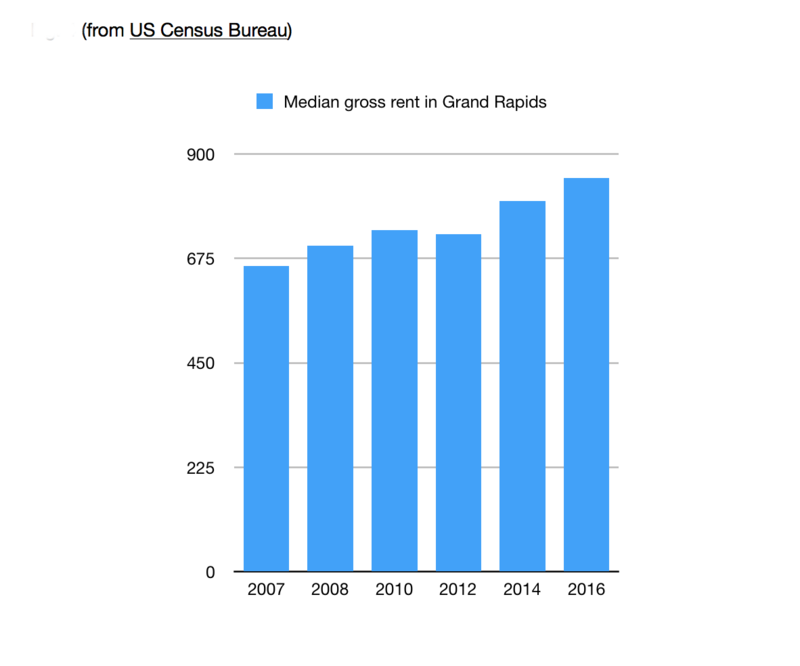 While 2016’s national median rent is still nearly 16 percent higher than Grand Rapids, that margin has shrunk down from 19 percent in 2007, and the trends indicate continued rising costs. In other words: homes appear to be getting slightly more expensive more quickly than apartment rentals, and while housing in Grand Rapids is still cheaper than the national average, our costs are rising more quickly than the national average, so we’re beginning to catch up. But this tells us nothing about the volatility of specific neighborhoods, and as we all know, real estate is all about location, location, location. And also about affordability—but we’ll get to that later. Looking at the real estate trends of Grand Rapids neighborhoods averaged together, a simple story emerges: things were doing pretty well in 2008, then things crashed, but they began to tick back up in 2012, and have been rising fairly steadily since, at a rough average of 10 percent year over year (fig. 5). The trends of individual neighborhoods, however, tell a somewhat more chaotic and inconsistent story. East Grand Rapids, for example, was impacted little by the recession, and its costs have skyrocketed over 45 percent since 2008, while Heritage Hill’s volatility has left 2017’s sales in a dead heat with those of 2010. Somewhat erratic data from historically (the last 20-30 years) financially distressed neighborhoods like SECA, Baxter, Madison, Alger Heights, Belknap Lookout, and South Hill tells a story of neighborhoods that are seeing some costs rise, but with a healthy number of affordable pockets remaining. In these neighborhoods, median home sales can vary as much as $100,000 month-to-month, a volatility indicative of a neighborhood with a mix of distressed and rehabilitated homes. 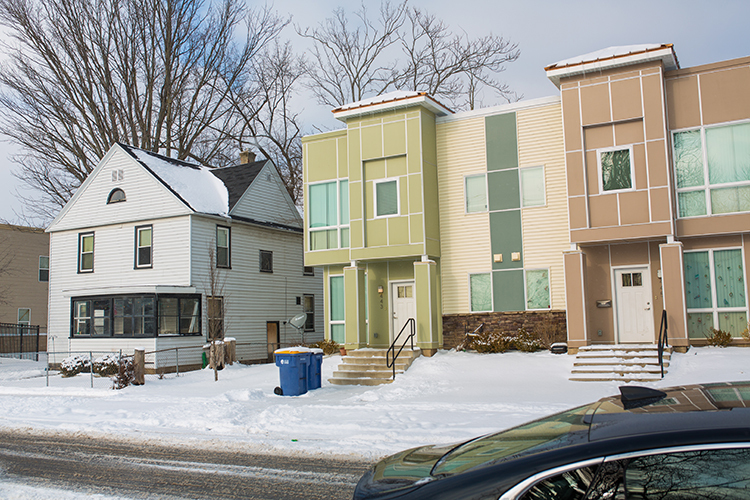 New and old houses put renters and home owners side by side as neighborhoods change with development. As the author, a South Hill resident herself can attest, these neighborhoods are still a ways away from significant gentrification. But they’re still headed that way. 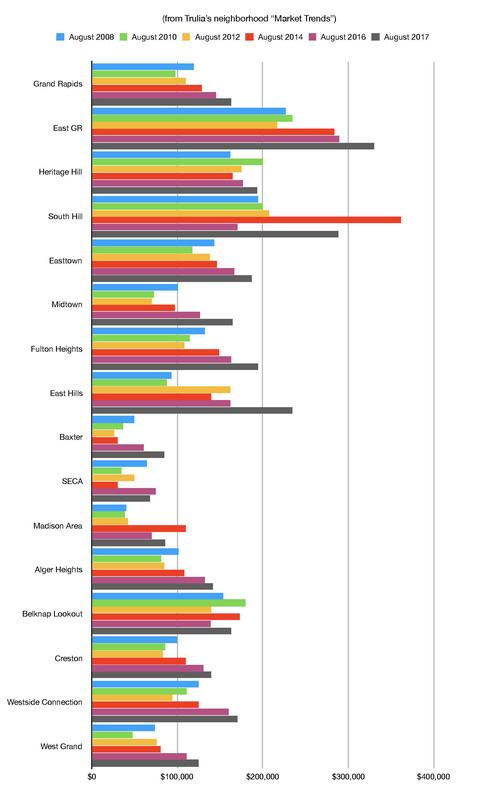 Neighborhoods that had been cusping on trending before the recession (like Belknap and Madison are now) have seen the most dramatic home ownership cost spikes, specifically: Eastown, Midtown, Fulton Heights, and East Hills. Creston, Westside Connection, and West Grand have also made significant gains, though costs still remain significantly below the city and national average. When looking more closely at the data of individual neighborhoods, it’s clear that housing costs still vary greatly from one neighborhood—and even street—to the next. Eastown, East Hills, and East Grand Rapids may be nearing saturation at costs higher than the average Grand Rapids homeowner can afford, but in the communities that lie at the lower end of the cost spectrum, affordable homeownership is still in supply—especially if you can swing a fixer-upper. “The rents and price points for new market-rate housing units that could be developed within the Target Market Study Area are derived from the financial capabilities of those target households with incomes at or above 80 percent of AMI [approximately $50,000/year for a family of four]. Essentially, this report assumes that market rate housing remains within reach of families of four who make as little as $50,000 in household income, at which point affordable housing is assumed to pick up the slack. What this ignores, however, are the students and households that don’t qualify for subsidized housing (or who don’t want to live under the restrictions of subsidized housing) for a variety of reasons. It also takes a bullish attitude towards the availability of housing on the affordable end of market rate (i.e. middle market)—yet a majority of Grand Rapids households are paying between $1000-1499 per month per housing unit (fig. 2). The report does not include what urban development experts often refer to as the “missing middle”—i.e., households who make between $35,000-60,000 per year, and who therefore fall in the socioeconomic bracket between market rate and affordable (i.e. subsidized) housing. This report reflects the way in which middle market housing is missed by both developers/investors and legislature pertaining to development incentives. 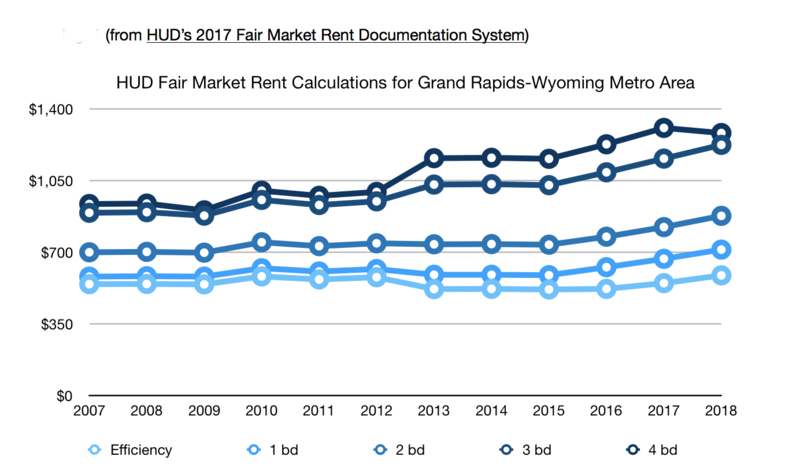 Meanwhile, HUD’s Fair Market Rent Calculations (FMR) for Grand Rapids/Wyoming—calculations that determine rates for affordable housing vouchers, section 8 contracts, and other publicly subsidized housing—have fluctuated little, with one notable exception: costs for subsidized family-sized housing (three to four bedrooms) have risen disproportionately to studio and two-bedroom apartments (fig. 3). 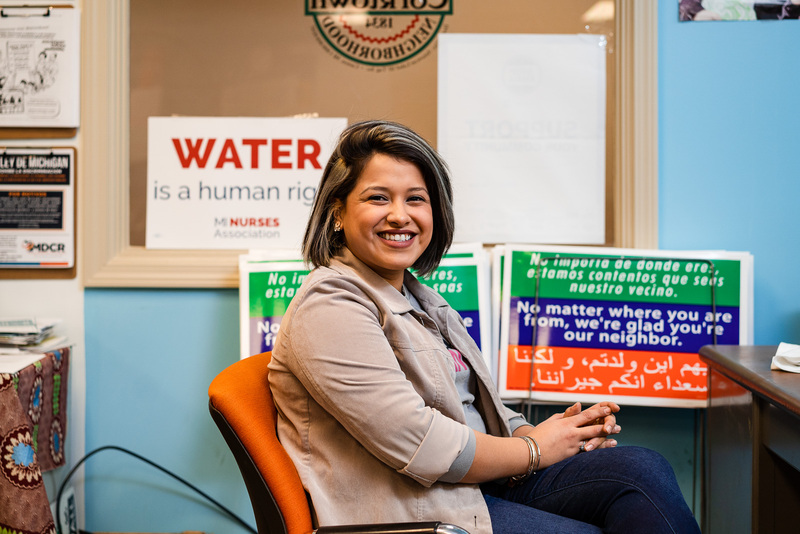 This, combined with home ownership costs that are rising steadily across Grand Rapids, essentially means that it’s harder than ever for poor working families to afford adequate housing. 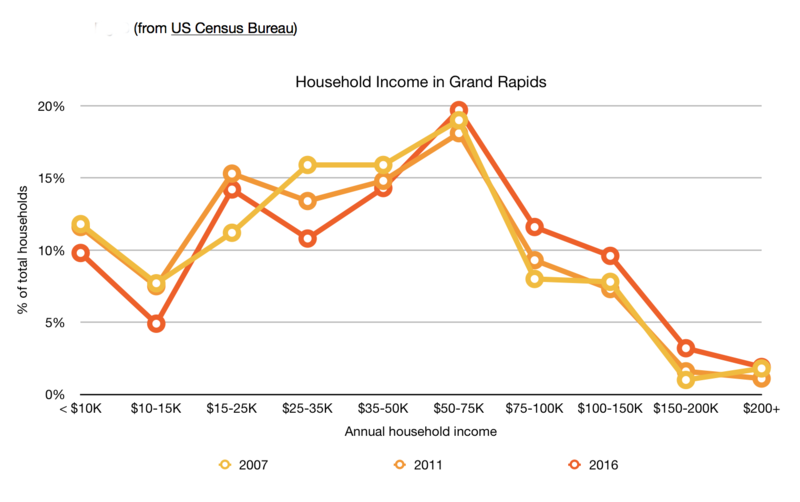 The median income of Grand Rapids residents rose almost 20 percent between 2007 and 2016, but that doesn’t mean residents’ earning power has increased equally across socioeconomic brackets. 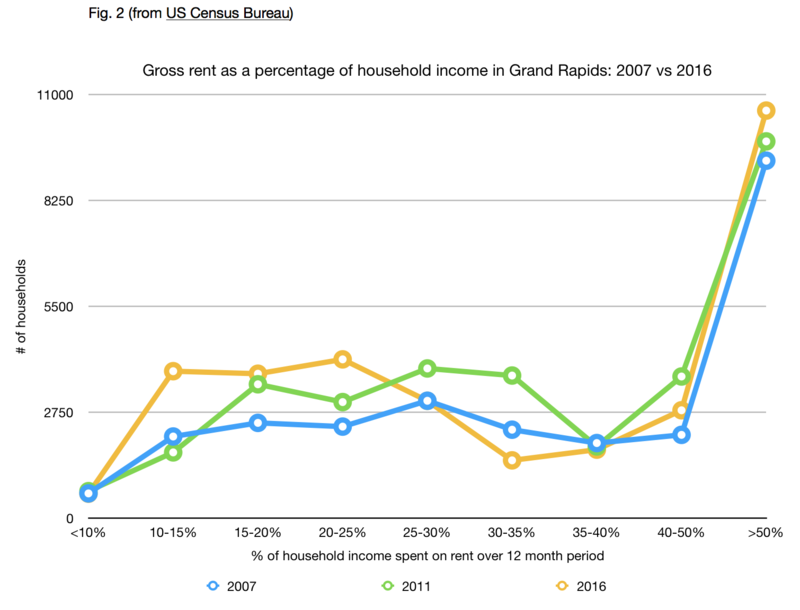 A visualization of household income in Grand Rapids in 2007, 2011, and 2016 (fig. 4) demonstrates that while income may have increased incrementally, much of that increase has taken place in the $75,000-200K brackets, with more households making $15,000-25,000 per year, and fewer making $25,000-50,000. It simply confirms what we already suspected: the rich got richer, and the poor got poorer. While it’s popular sentiment to assert that the rent “is too damn high,” it’s clear that there’s a more complicated equation at work. The reality is that increases in housing costs would have little impact on the affordability of housing if income increases were equally distributed across socioeconomic brackets. But they’re not. 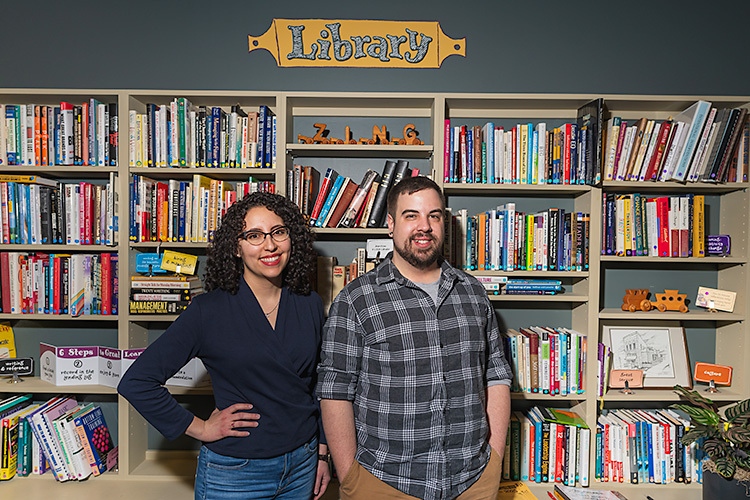 Shrinking middle class wages, combined with a vacuum of non-subsidized, below market rate housing supply, have made it increasingly difficult for middle class Grand Rapids families to access adequate housing. That being said, if the last ten years have taught us anything, it’s taught us to be leery of bullish attitudes towards real estate trends. As a whole, homeowners and upper middle class residents can be pleased at the growth and promise of Grand Rapids’ real estate market as long as the gaps of middle housing and shrinking middle class income are addressed—soon. 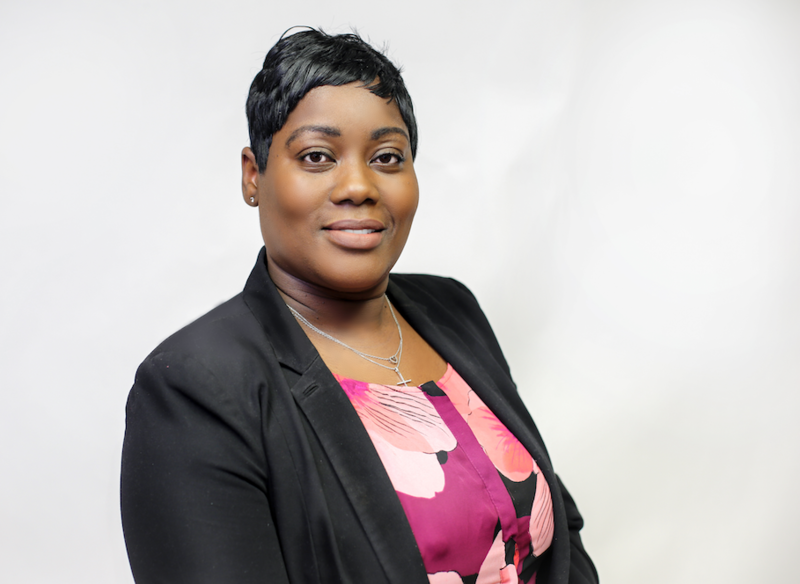 This article is the first in a nationwide series on Housing across the many publications of Issue Media Group. As cities grow and the population as a whole becomes more urban, housing is an ever-pressing issue. 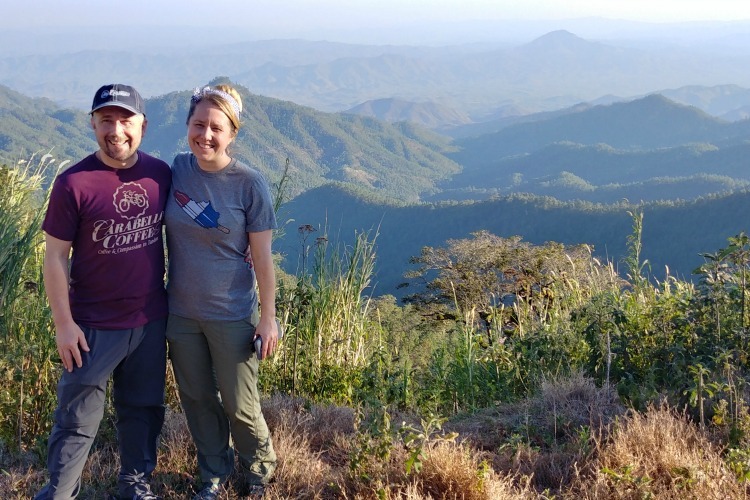 Tackling the tough topics at the heart of where and how people live, IMG invites you to explore Housing in all its iterations over the next year.